In this lesson, we're going to talk about balance as it relates to our lives. We often hear that we should live a life of balance or that we should seek balance in our lives. Most of us live fairly hectic lives. We have long to-do lists and many work and family responsibilities. Life can often feel overwhelming and off-balance. Achieving balance sounds like a pretty good idea! Let's examine how a shift in thinking about the word balance might help you live better. Part of my morning routine is to spend time reading personal and professional development books. Are you wondering how in the world I do that with a two-year-old? The trick is that I wake up early. I wake up one hour before my daughter so that I have some time for myself. 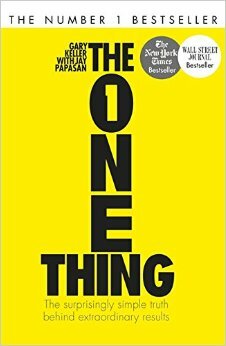 I was recently reading this book, The One Thing by Gary Keller, and I came across an idea that helped me think about how to live better. The idea relates to grammar. Here's what the author writes. "Nothing ever achieves absolute balance. Nothing. No matter how imperceptible it might be, what appears to be a state of balance is something entirely different - an act of balancing. Viewed wistfully as a noun, balance is lived practically as a verb. Seen as something we ultimately attain, balance is actually something we constantly do." Think of balance as a verb rather than as a noun. We can categorize our words into groups called the parts of speech. Nouns and verbs are two of the parts of speech, and balance can be a noun or a verb. Nouns name people, places, things or ideas. Verbs tell us what something is or does. Gary Keller, the author of this book, challenges us to think of balance as a verb (something that we do) rather than as a noun (a state that we attain). As he says, "Balance is something we constantly do." I found this idea quite helpful, and I hope that you do as well! It reminds me to live my life in a particular way rather than to pursue a particular state. Tip: Most words can function as multiple parts of speech. See the difference in sentence diagrams. Sentence diagrams are pictures of sentences that illustrate the grammar of the sentence. Here is an example to show you how some of the parts of speech are diagrammed. Let's look at how the shift from balance as a noun to a verb looks in a sentence diagram. My life is in balance. Balance is the object of the preposition in. It's a noun. Understanding grammar helps you think. Most of us think of the parts of speech as something that we learn in order to know more about grammar and language. I like this idea of shifting balance from a noun to a verb because it shows us how the parts of speech themselves are useful concepts for understanding life and how to live. I continually find your wonderful email messages to be uplifting and inspiring. Quiz yourself! Identify each word's part of speech.